Posted on September 5, 2014 at 1:54 am. 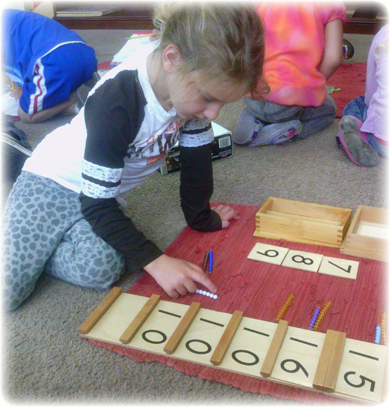 Learning Control of Movement-Rolling A Rug, Carrying A Tray, and Carrying A Chair. Learning Grace And Courtesy- How to Introduce Yourself, How To Say Please And Thank You, How To Interrupt Another. Discussing what it means to be kind to others and what are “kind words”. Making a “Kind Words Chain” in pre-school lesson. Reading the book, “The Bear That Was Chicken” and discussing with the children how they felt before coming to school and how they feel now about school. Lessons on saying “Excuse Me”, “I’m Sorry”, and “Thank You”. Singing songs and playing game to review what we’ve learned about classroom rules and manners. Having the children write our classroom rules and display them in the classroom. Read the book “There’s A Bird On Your Head”. Discuss how to speak to someone when we’re frustrated. Graphing our differences such as hair and eye color. Practicing saying our full names. Read the story “Little Bear’s Star”- Story about an apple. Sorting apples by size and color. Learning the fractions of one whole and one half using an apple. Taste testing different color apples and making a graph, as a class, of our favorites. Learning the Apple Life Cycle. Discuss differences between Summer and Fall. Go on a nature walk outside to find leaves. Learning the parts of the leaf. Learning Robert Frost poem about Fall. While reading a book have your child point to all of the letter of the week she/he can find. 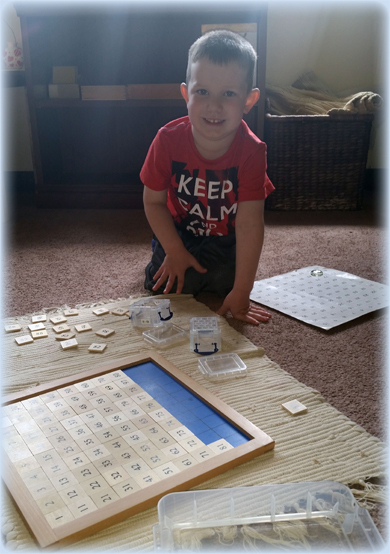 Have them do this with the sight words as well. Play I-Spy using things that only start with the letter of the week. Go on a walk as a family. As Fall comes, point out the differences you see in nature, now that the weather is changing. Posted on September 5, 2014 at 1:53 am. Create a kindness quilt to help students think about and how to show acts of kindness. Starting on Monday Ms. Kate will be sending home a paper bag with each of your children. Please have your child decorate their bag and fill it with three of their favorite things. Please bring back on Friday. Posted on July 28, 2014 at 2:14 am. We started off May talking about the Solar System. 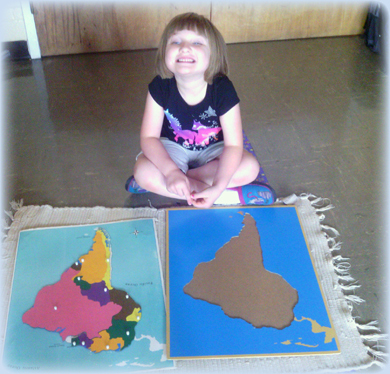 The children learned the positions of the planets and their relative sizes and distances. They had a blast using 3D models of the sun and planets to place in order. We talked about how the sun is the biggest star and why it is so important. We also made constellations with toothpicks and marshmallows. We discussed the different phases of the moon and made them using chalk and construction paper. On Friday for science, we made moon sand and the children had so much fun playing with it! 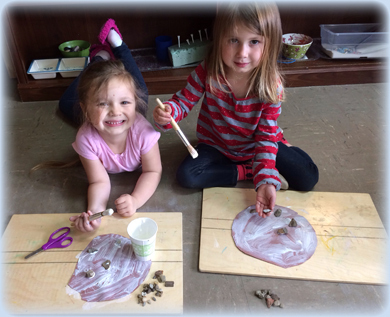 The second week of May we talked about dinosaurs and what their habitat was like then the children made their own habitat using sand, rocks, plastic plants, toy dinosaurs, clay, and dirt. They learned different physical attributes of dinosaurs and their names. The children demonstrated an understanding of herbivores, omnivores and carnivores. We also dug out tyrannosaurus rex fossils and put the pieces together. For science we exploded the volcano, the children put in the habitat earlier in the week, using baking soda and vinegar. The third week of May we talked about transportation. The children quickly developed an understanding that transportation means to carry things from one place to another. We named all the different methods of transportation like plane, car, boat, bike, horse, train, bus, subway, helicopter, etc. Students learned safety rules for all methods of transportation and practiced crossing a fake street setup in the classroom. We placed a car at the top of a ramp and asked the children how far it will go. We recorded their answers with tape with each child’s name on it. We did this on the carpet first together then they switched to a smooth surface and tried it with their friends by making their own ramps and using different cars similar to the real cars adults use, and they also learn about the automotive services can be found online at sites like http://www.atloceanside.com. The children really enjoyed the last week of May when we talked about sports. The children used their gross motor skills to march, skip, gallop, etc. 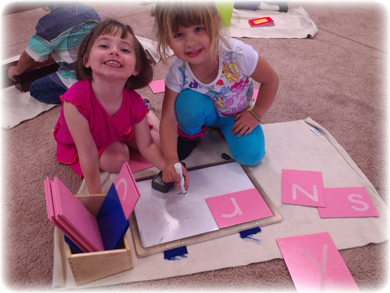 They learned how to engage in imaginative and creative play indoors and outdoors involving their friends. We played many games that involved team effort and good sportsmanship. We also made balloon powered cars for science this week using balloons, straws, tape, and toy cars, we also got some help on PCH. 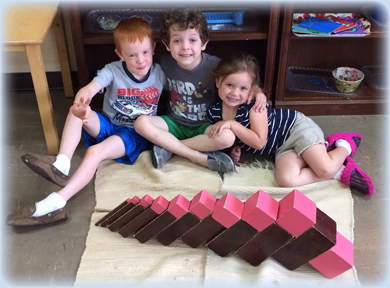 The first week of June we focused on summer games, activities, and experiments the children could do at home. We froze different color ice cubes for the children to put together in a glass and observe as the ice melts to make a new color. We also discussed summer safety rules while playing outside and playing with or in water. The children learned how to make homemade ice cream and enjoyed the tasty treat together! I hope everyone has a fabulous summer and I can’t wait to see all the smiling faces in the fall! Posted on July 28, 2014 at 2:09 am. This last month of school was busy and productive in our classroom! During the first week, we learned about fish and other creatures of the ocean. We started off the week by learning the parts of the fish during morning circle time. We then discussed the characteristics of fish. We learned that fish breathe through their gills and breathe oxygen from the water. We also learned that fish have scales, and fins to help them swim. During preschool lesson, Ms. Kim continued the discussion by teaching the children the names of all five oceans. The children also enjoyed learning about sharks, turtles, and octopuses. We learned that a shark’s entire body is made up of cartilage, just like the cartilage that is in our ears! The children also made a fun jellyfish craft with Ms. Kim during preschool! 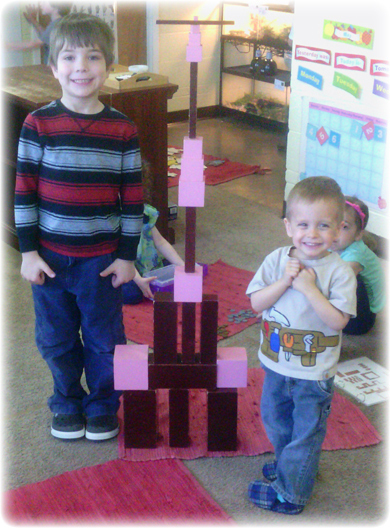 In week two, we learned about Community Helpers. We learned that a Community Helper is someone who has a job helping others, such as a doctor, a fireman, a police man, a teacher, or a mailman. We also learned that our moms and dads are community helpers in our homes because they love and take care of us. We also learned ways we can be a community helper in our homes and communities as well. We learned that by simply helping mom and dad with household chores, keeping our rooms clean, helping little brothers or sisters, etc. can help our family in a big way! Students also enjoyed making a fireman’s hat craft, and police badge craft, and a doctor bag craft with Ms. Kim in preschool. 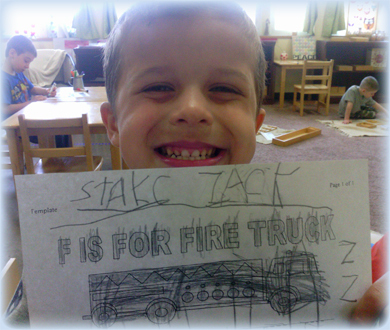 We also had fun singing songs about firemen and policemen during circle time. It was so much fun! During the third week, we studied mammals. We discussed the characteristics of mammals. We discovered that mammals have hair or fur on their bodies, that they breathe oxygen from the air around them, that they give birth to their young, that they feed their young with milk from their body, and that they are warm blooded. The children also enjoyed learning the parts of the horse, and reading the book, “It Could Sill Be A Mammal” during circle time. We also learned about Lions and Grizzly Bears. We learned that Grizzly Bears live in dens, and that the female Lion is actually in charge of hunting for food. 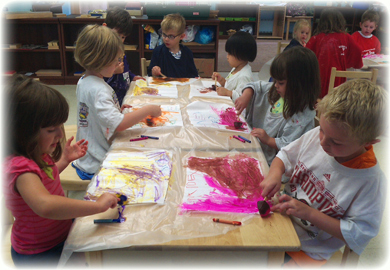 The children also enjoyed making a Lion and Grizzly Bear craft with Ms. Kim during preschool! In week four, we learned about reptiles and amphibians. We learned that a reptile has scales or scutes on their body, they lay eggs, and they leave their young once they are born. The children enjoyed learning about lizards and snakes, and even about Komodo dragons! We learned that the Komodo dragons bite is poisonous, and that Komodo dragon will even eat people! Luckily they live in Indonesia! The children also enjoyed learning about frogs and their characteristics and life cycle. They also enjoyed making a frog craft with Ms. Kim during preschool. During week five, we learned about summer safety. We learned about safety when riding in our car, safety in our home, when riding our bikes, at the pool, which need to be clean with a cleaning service from http://cortspools.com. We also learned how to dial 911 if there is ever an emergency. Ms. Kim also used the story of Little Red Riding Hood to illustrate to the children why we should not talk to strangers. 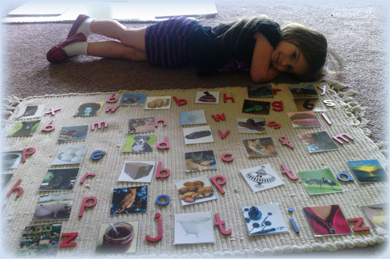 I would encourage you this summer to take time with your child and practice their letter sounds with them. Even playing simple games such as “I Spy” will help with this. I also encourage you to make a trip to the library to find books on subjects that interest your child. 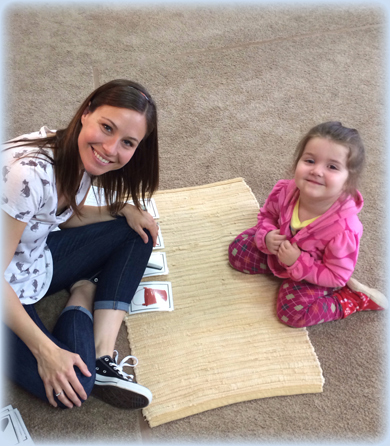 Reading with your child will instill in them a love for reading as well! I have enjoyed this year immensely! I hope your children did as well! It is my privilege and honor to be their teacher! Posted on July 28, 2014 at 1:53 am. May was such a busy month! Our class dove into water and learned about the sea and jumped into a space shuttle and flew into outer space. Our class also had fun learning about plant life cycles and had a blast during Grandparents Day and at our field trip to the zoo! The first two weeks we explored the animals of the ocean. We began by defining mammals. I explained they are warm blooded and both land and sea mammals have hair on their bodies and give birth to their babies. The first mammals we discussed were the dolphin and whale. The children learned dolphins can stay under water for 15 minutes, but can’t breathe under water so they have to come up for air. The children learned they live in groups of ten to twelve and there are thirty-six different kinds of dolphins. During this discussion we talked about how the Killer Whale is the largest dolphin. The second group of mammals in the sea we discussed was whales. The children learned whales breathe like us and they can only stay under water for a short period of time and then they have to come up for air by using their blowhole on the top of their heads. They also learned there are two types of whales: the Baleen and the Toothed whale. The children were interested in what whales ate and how fast they can swim. Together we looked through books and found out that whales can swim up to 30 mph and that baleen whales eat krill and toothed whales eat small fish along with other small mammals. The last mammal of the sea we discussed was the Manatee. The children discovered manatees were first seen by fishermen who saw the long tails and thought they were looking at mermaids! The children also learned that they could weigh as much as 2000 lbs., and can swim up to 20 mph hour but usually cruise around the sea at 2 to 6 mph. Also, during that week the children made a Venn diagram about fish and mammals. The children did a great job with this activity. They knew that fish do not have lungs, but have gills instead. Mammals are warm-blooded and fish are not. That most mammals live on land, but fish have to stay in the water and both have a vertebrate. What smarties I have!! We then focused on outer space. During this time we learned about the solar system, stars and constellations, galaxies, the eight planets, the sun and moon, the space shuttle, and the first man who walked on the moon. Wow, what a busy couple of weeks! We first stared out by creating a web of the solar system. Throughout our space lesson the children added the information they have learned onto the web. During our lesson, the children learned about the eight planets since the 9th planet is now a dwarf planet. They learned the order of the planets and interesting facts about each one. They loved learning about Jupiter and its famous hurricane like storm. They thought it was pretty cool that Mars is called the “red planet” due to the red dirt, dust and sky. We also learned how there are thousands of different galaxies and how the spiral shape is the most common type. The children learned about night and day. For this activity I had one child stand in the middle of the circle and pretend they were the sun. I then had another child pretend to be the earth. I explained to them that the Earth takes 365 days to orbit around the sun, but as it’s orbiting it is also rotating. The kids loved this activity!! During this time we talked about what stars are, the lunar eclipse, the different constellations, and about observatories. We then talked about Neil Armstrong and how if they went to the moon they would still see his footprint. Near the end of our outer space lesson the children learned about life in space, gravity, and astronauts. I showed a video of a launch and what it is like for astronauts up in space. The children loved it!! We then focused on the plant life cycle. 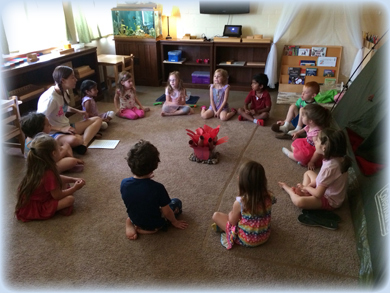 The children learned the parts of the flower, what plants need to grow, and the purpose of the stem. We also had fun placing celery stems into dyed water to show how plants drink through their veins. The children also examined inside of a lima bean and then placed the seeds into a baggie to watch them grow. They had such a great time learning about plants! 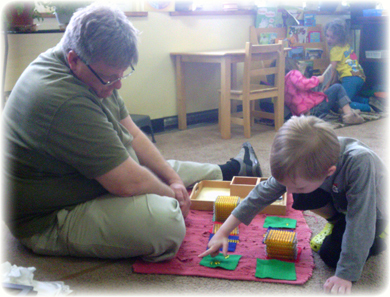 Also, during this month we celebrated Grandparents Day in our classroom. The grandparents were able to come in and join us for a special line time, Science class and then a craft. It was such a special day for the children. With the last two weeks remaining, the children had a blast learning about different insects. We discovered insects have six legs but spiders and other arachnids have 8 legs. The children were also able to learn the life cycle of the butterfly and find out why bees are so important to us. We also had fun discussing ladybugs and other beetles. During the last week of school the children learned about who invented ice cream, watched a video about how ice cream is made, learned all about camping. Also during the last week we had an ice cream party and a mock camp out with s’mores! Wow what a week we had! 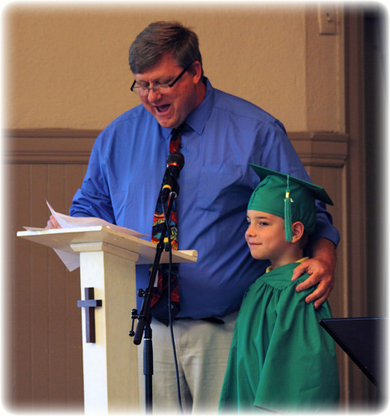 I can’t believe how fast the school year has gone by. I have truly enjoyed watching my students grow throughout the year. I will miss them so very much. Also, thank you to all of my families, for everything that you have done this year. I wish the best of luck to those families who are going to new schools and look forward to seeing everyone else next school year! Have a great summer!! !